Objective: Train at Andy's Golf Course to become the best golf player, here, you will face challenge after challenge, that will surely improve your skills. 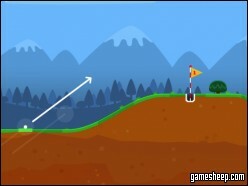 Overcome the obstacles in the way with a small number of golf strokes for a perfect score and hit a hole in one! We are glad that you have chosen to play Andy's Golf on GameSheep.com, the most dynamic website available. If you like this game Andy's Golf don't forget to rate it and this way you will help with selecting only the best games for the home page.